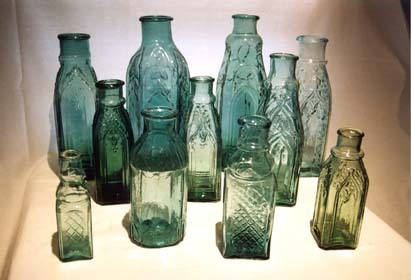 Pickle bottles and jars first appeared around 1860; the early examples have pontiled bases. The most popular style amongst collectors is the cathedral with fancy gothic styled sides as shown in the picture to the right. Common in aqua, the rarer examples in yellow and green command high prices and are very sought after by collectors. The pickle to the right is a mid-sized 11" cathedral-style pickle jar from Wellington CT 1850's. Has iron pontil but most important is the very rare amber color; less than 5 known examples in this color (usually occurs in green). Here's a better picture that shows off the color. This example is in mint condition with 3 arched panels - the 4th panel is plain (for label). This fine pickle sold for a record $44,100 March 31, 1999 at eBay. Here is a green Wellington cathedral pickle , in the smallest size and with a pontilled base. It was "dug" in a blue stone pit in Melbourne Australia, where they occasionally find coloured examples of pickles in pieces but rarely intact. Photo/info courtesy of Greg Dean.